Happy Spring everyone! It’s Kelly Klapstein here, and I’m excited to share a different kind of project than I usually make. Here is a mixed media canvas I designed using lots of pretty 3D Foam Designer Shapes. Here are some close ups and details about how I altered all the different 3D Foam Shapes. 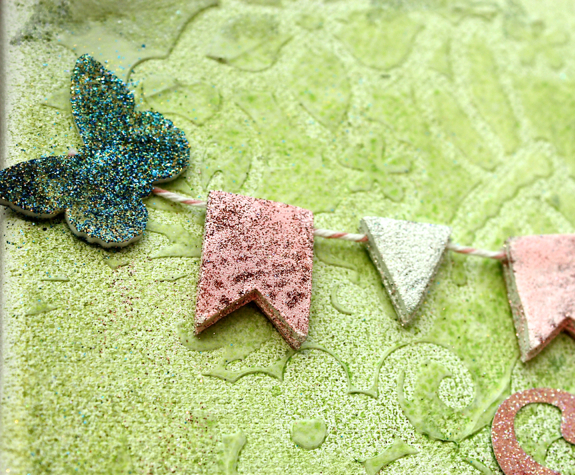 I added blue and yellow glitter to the 3D Foam Butterfly, and I heat embossed the 3D Foam Pennants with pink and white glitter embossing powder. 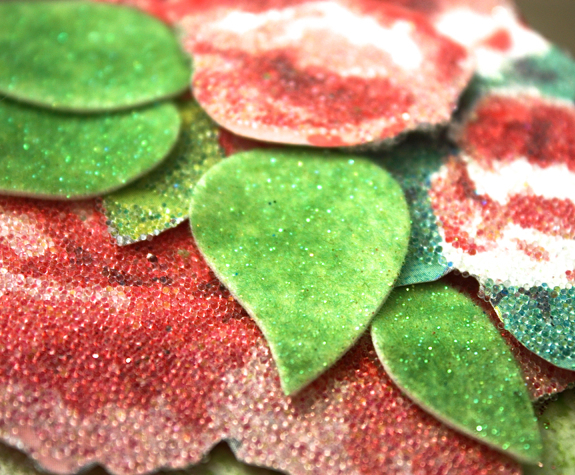 The 3D Foam Leaves are covered with green flocking. 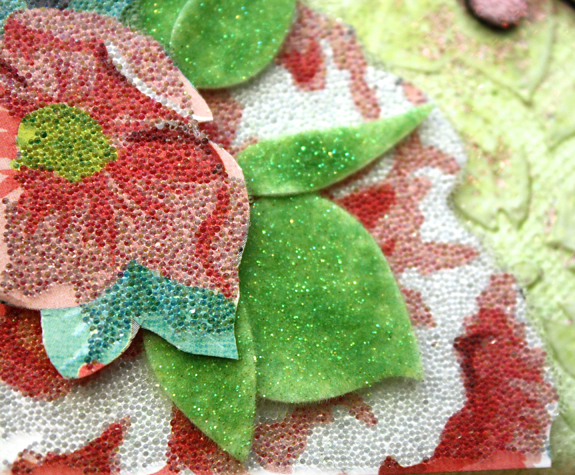 After fussy cutting the floral patterned paper, I pressed Adhesive Sheets on top and then adhered clear microbeads.All of the floral paper pieces are layered with Crafty Foam Tape and 3D Foam Squares. My ‘Spring’ title was cut with my electric die cut machine. I put an Adhesive Sheet onto my patterned paper before cutting, and then removed the backing afterwards and applied clear glitter. This made my title sparkle! 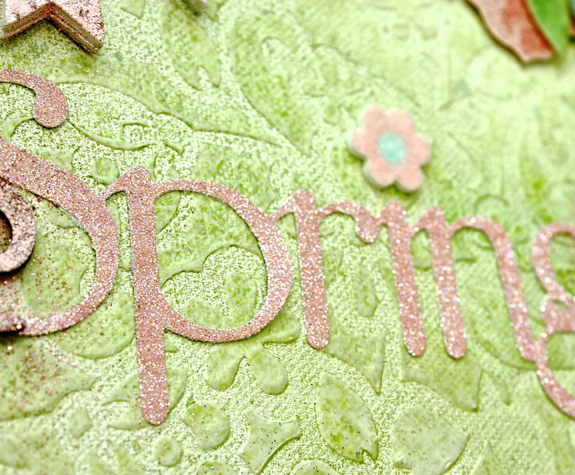 The little flower with flocking that is dotting the ‘i’ in ‘Spring’ is from the 3D Garden Shapes. It’s always nice to have some spring home decor on display to celebrate the end of winter! This entry was posted in 3D Foam Shapes, 3D Foam Squares, 3D Projects, Adhesive Sheets, Adhesives, Altered Art, Canvas, Crafts & Tutorials, Crafty Foam Tape, Home Decor, Mixed Media, Seasonal Craft Ideas, Spring and tagged 3D Foam Butterflies, 3D Foam Garden Shapes, 3D Foam Leaves, 3D Foam Pennants, Canvas, Embossing Powder, Glitter, Home Decor, Kelly Klapstein, Spring. Bookmark the permalink. 4 Responses to "Spring Mixed Media Canvas with 3D Foam Shapes"
P.S. Oooops!!! 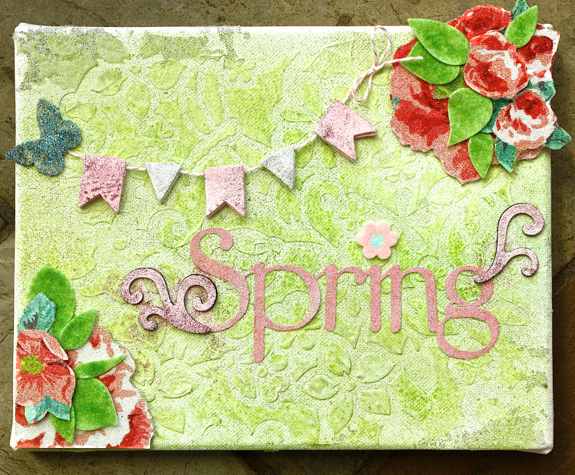 Fabulous Spring Canvas you created btw! LOL!! Loved how you embellished the 3D Designer Foam shapes! I think Chicago FINALLY hit spring this week. Adorable Kelly! So nice to see a touch of spring….soothes my winter weary eyes! lol I’m sure the 3l team will really miss you! Phenomenal mixed media canvas, Kelly!! I am going to miss you soooo much on the team!! But WOWZA what a way to go out. This is absolutely stunning.